Through common curricular requirements, our students engage intellectually, integrate knowledge and essential skills, expand their curiosities, and embrace learning and service as lifelong commitments. 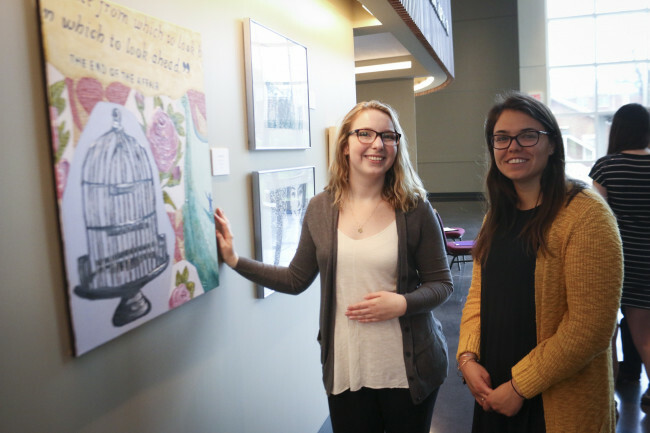 Over their four undergraduate years, students encounter topics that arise from the arts, humanities, sciences, and religion; develop thoughtful responses to ethical questions; and seek to understand their political and social responsibilities as citizens in an interconnected world. Birdie Mullins, '18, and Sophia Alonge, '17, at Ampersand Day 2017. Transitions: The first-year course to help students adjust to living and learning in the academic community. Foundations: A second-year course that explores historical and contemporary understandings of the human condition, “ways of knowing,” and ethics. Lifetime Wellness: A one-hour course designed to promote a healthy lifestyle, along with two physical activity courses. Great Works in Context: A third-year course that immerses students in a multidisciplinary study to understand how literary and/or artistic ideas influence society. Religion: Each student selects from various courses to gain a better understanding of the importance of religious beliefs and practices to the lives of people all over the world. Emory Abroad: Students select an international experience, from a semester abroad to a short trip experience tied to a single course. Connections: A senior capstone course with students from multiple majors who study a broad public problem with an emphasis on local, regional, and global institutions. Students choose one course in each of the four areas to create a broad, interdisciplinary foundation. 1. Understanding the Individual and Society: Courses to analyze and explain the how people interact with the communities around them. 2. Understanding the Natural World: Courses to apply scientific methodology to natural phenomena. 3. Artistic Expression: Courses to develop the creative process through aesthetic expression. 4. Interpreting Texts: Courses to analyze and interpret texts such as literature, historical documents, and art. Value and pursue the benefits of lifelong physical fitness, balance in work and recreation, and psychological well-being. Use applied learning experiences such as laboratories, internships, formal presentations, and critical thinking exercises to further knowledge; realize the continuity between past and present events; use information and technologies proficiently and appropriately. Generate original ideas and apply the methods of analysis, synthesis, and reason; create clear and persuasive oral and written arguments; communicate effectively in individual and group settings. Interpret and use numbers and mathematics confidently, ethically, and appropriately; apply numbers to real-life experience; appreciate quantitative reasoning as a tool of intellectual inquiry and communication. Value visual and performing arts as forms of human expression; understand and interpret art through creation or analysis. Develop knowledge about natural science and the experimental process; learn and apply the scientific method. Be able to engage in a variety of disciplines as well as understand their purposes, interrelationships, and contributions to human knowledge; analyze and interpret significant literary texts as they represent the variety of individual, social, and cultural contexts of human experience. Appreciate the role of service in the community; be a responsible citizen of the state and nation; be cognizant of the impact of one’s actions on others. Understand and appreciate diversity in cultures, politics, and belief systems; comprehend and analyze the meaning of the local, national, and global; develop proficiency in a foreign language; broaden one’s perspective through regional, national, and international travel. Critically examine one’s own beliefs; strive for consistency in personal ethics; be aware of the consequences of political and ethical positions.